Network Cabling is the most pivotal part of an organization, which connects entire nodes of communication systems, LAN, Work Stations, Servers and other means of network services effectively. To maintain proper and secured infrastructure, an organization should hire accurate Network Cabling Services provider. VRS Technologies is notified of its extreme Network Cabling Services and has endowed countless Structure Cabling solutions to SME’s in Dubai. Structure Cabling needs to be built properly into an organization because the complete business development relies on the network cabling solutions. Without this, one cannot transfer data, voice calls, and server messages or can’t even secure their business from threats or unauthorized access. Appropriate maintenance of network cabling maximizes efficiency at work & network, which transmits high amounts of data possibly even to networks connected at larger distances. 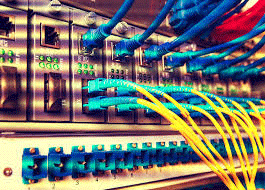 The digitalized technology connects both wireless and wired networks interconnecting enormous business network cabling services. These are structured according to the bandwidths with respect to the concern business management. Depending upon the structure, the respective vendor should maintain a right manner of labeling their channels/panels where the cabling connections are into. This helps to have exact problem resolution at times of issues. Should maintain quality at all installations of networks, so that an enterprise should gain standard structured cabling services for their data centers. Need proper management of structure fiber cabling, well-planned, quality/quantity in design to maintain the panels. Allocating proper management of structured cabling solutions ensures to solve/find the obstacles easily when they arise and takes less effort/time to solve. Robust development in technology has brought literally adequate change in building communication system, networks, and work progression of an organization. So, entrepreneurs think to incorporate everything “the best” and absolutely hires for the best as VRS. VRS Technologies is the prime solution provider for Network Cabling Dubai and excels by enabling ideal structure cabling solutions to our clientele. Our highly skilled and professional network management team lays a detailed and sustainable mark at catering their services. Till the date, we cracked many challenges and still more to do. If you want a firm organization with chief Network Cabling Dubai services, contact us on +971-55-5182748 or else ping us on www.vrscomputers.com.